In the Poulton and District Primary League’s U12s section, BJFF Warriors clinched the title with a dominant 6-1 win against Thornton Cleveleys Whites. Captain Josh Smith bagged a hat-trick, while Daniel Knight, Jacob Cleary and Gabe Potts also found the back of the net. It means Warriors ended the season unbeaten and have now won two consecutive titles, as well as being the reigning PDPL tournament champions. In the U12s Conference, Wyre Juniors saw off BJFF Vipers in a seven-goal thriller as they also picked up the league title. The pressure and nerves had originally looked like it had got to Wyre as the Vipers took the lead within the first minute. But Wyre responded swiftly and equalised with a well-taken goal from Harry Morris. 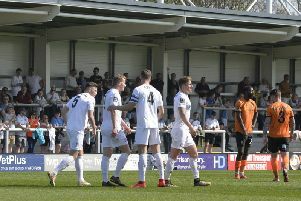 Vipers retook the lead and were brimming with confidence as they knew a win for them would also see them promoted. But Connor Ashton made it 2-2 with man of the match Will Whiteside putting Wyre 3-2 up. It looked like Wyre were on the home run but a brilliant free kick brought Vipers level. With the game looking like it would end level, Harry Morris sneaked in at the back post and sent a left footed finish flying into the top corner to seal the win for his side. Poulton Town recorded a 5-1 win against Fleetwood Gym in the U15s Cup. Paul Humphries was given the Man of the Match award for a fine defensive play. In the U14s Cup, Poulton Town drew 1-1 against Spirit of Youth in a hard fought and entertaining game. Both sides gave their all with Spirit scoring a 25-yarder to open the scoring, only for Poulton to equalise late in the game through Max Harrison’s goal. In the U14sleague, YMCA edged a tight game against BJFF Vipers 1-0. A very heavy pitch made it difficult for both sides at the Gala Field. The first half was a very scrappy affair in which neither team really came to terms with the boggy conditions and it was no surprise that the game remained a goalless stalemate at half-time. As the pitch cut up even more in the second half the contest didn’t improve much as a spectacle but one attack of real quality led to YMCA finally breaking the deadlock. A five-man move starting in their own half ended with Josh Dolby-Armstrong, who was outstanding throughout, firing home a goal which proved to enough for YMCA to clinch all three points in an easily forgettable game. Meanwhile, in the U15s league, BJFF Blades beat YMCA 3-2. This proved to be a very close contest between two evenly matched teams. YMCA started brightly and carved out three good scoring chances in the opening 15 minutes without being able to convert any of them. Blades came more into the game as the half wore on and they took the lead in very fortuitous circumstances. They were awarded a free kick just outside the area and YMCA keeper Callum Munro tipped the ball on to the crossbar but it came down, struck him on his back and rolled into the net. It remained 1-0 to the visitors at the break but YMCA continued to create chances after the restart before the Blades scored twice in a five-minute spell midway through the half to take a 3-0 lead. YMCA continued to attack and were rewarded 10 minutes from time when Jeorge Coulthard pulled a goal back with a firm header from a well taken left-wing corner. Taylor Stock reduced YMCA’s deficit further in the closing minutes but the visitors held on to go home with the points. Toby O’Neil was outstanding throughout for YMCA, keeper Muir impressed with some fine saves, while Olly Fishwick and Callum Muir were also both notable. Foxhall U18s retained top spot in the Blackpool and District Youth Football League after a Charlie Allan hat-trick helped them to a 6-0 win over Staining. Allan’s goals were backed up by Tom Figg, Harry Dale and Conor Smith also hitting the back of the net. Meanwhile in the inter-club clash, Fleetwood Town ran out 5-2 winners against Fleetwood Town Rangers courtesy of goals from Callum Cruikshank (2), Will Donegani, Stephen Abbott and Ryan Jackson. Will Brown and Jakob Hurst replied for Rangers. In the U16s section, second-placed Poulton FC continued their unbeaten run by defeating Layton 3-1 to close the gap at the top of the table. Steven Lambert, Ryan Norman and Louis Talarcyzk scored for Poulton with Jack Smith netting Layton’s goal. Foxhall defeated St Annes 3-1 and Blackpool Rangers Seasiders saw off Spirit of Youth 6-3, thanks to two goals apiece for Jake McVeigh and Jamie Rodgers, with Tom Cranshaw and Luke Marshall also netting. Two goals from Kyle Townsend and a further goal from Bailey Pack netted for Spirit. The spoils were shared in another high scoring game as Warton Typhoons drew 4-4 with FC Rangers. Warton’s goals came from Liam Gerrity (2), Dom Mitchell and Will Carter while Ben Hindley added to Kyle Wylie’s hat-trick for Rangers. There were no games in the U13 Gold section due to the LFA Cup games, while the match between Thornton Cleveleys Reds and Kirkham Blues was called off due to a waterlogged pitch. Foxhall lost 3-1 on their trip to Briercliffe Celtic, with Josh Brown getting their goal. Blackpool BJFF Blades ran out 4-3 winners on penalties as they progressed to the quarter finals of the LFA Cup at the expense of FC Strickerz, after the two sides drew 1-1 during normal time. The other LFA Cup tie between Squires Gate and Ribbleton was postponed due to waterlogging on the Squires Gate pitch. In the U13 Silver section, BJFF Vipers lost 3-1 to the improving Lytham Maroons, who are now closing in on the top half after goals from Kallum Illingworth, Kyle Costin and Louis Eunson. FC Rangers took on top of the table Layton and fell to a narrow 2-1 defeat. Matthew Guy was again on the scoresheet for Rangers while Karl Pachecho and Billy Ogden bagged for Layton. Matthew Nixon bagged four as Kirkham Reds saw off Lytham Blues 8-1, for whom Erik Zogo was on target. Kirkham’s other goals came from Dominic Turner (2) and Brett Higginson (2). Thornton Cleveleys Whites eased to an 8-2 win against Foxhall Hoops, with their goals coming from Prince Yelegon (4), Max Swarbrick (2) and a goal apiece for Adam Meadows and Jaydon Walsh. Connor Edmundson and Connor Satchell scored for the Hoops.